​What's Going on with MVVS? What a very busy year! Andy, Allondra and I are always learning new things about how to manage life as a new family with constantly changing schedules and needs. So far its gone pretty well! I've been quite happy to resume work and have found myself continuing to see my routine chiropractic and acupuncture clients while getting to meet many new people for saddle services. The saddle fitting and sales part of my business seems to grow everyday and I've been busy adding demo stock. As an independent fitter I strive to maintain a wide variety of saddle types from different manufacturers for a variety of horses and riders. That said each and every saddle I represent and stock has to be first and foremost a saddle I would be happy to put on my horse and ride in myself. If what I have in stock is not exactly right for you customized saddles can be easily ordered. Recently I have found myself working a lot with the adjustable saddles produced by thorowgood. I am happy to announce that I have gotten the green light to carry the sister companies Fairfax and Kent and Masters. These three saddle lines in addition to the more customizable Hastilow provide a wide variety of saddles and options at varying price points all built on the adjustable simatree. I have continued to enjoy all the work I have gotten to do on your horses and saddles! The chiropractic and acupuncture will always be the concentration of May Valley Veterinary Services, however, the addition of saddlery services has added a new tool to help rider and horse be comfortable in new, rewarding and often educational ways! The saddle demo supply continues to grow and I've been really pleased with each of the saddles I've gotten in. I'm excited to announce that I have been able to secure a stockist relationship with both prolite and thorowgood. 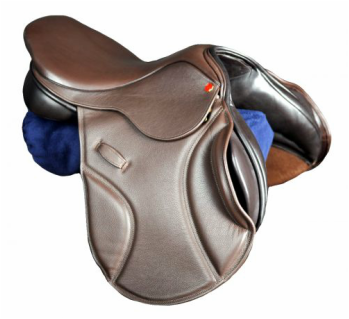 Thorowgood offers a wide range of synthetic and part synthetic saddles on the same adjustable simatree that the Hastilow Concept line has been so successful with. The thorowgood saddles have many of the features we come to expect from a high quality english saddle (high standards of manufacturing, wool flocked panels etc) at a much reduced price. These saddles offer a great option for the rider on a budget who needs a saddle that will accommodate a wide variety of horses and/or hold up to everyday use. My first two thorowgood demo saddles are expected in early July! As we hopefully start to see the end of the wettest winter on record in western washington I think we are all turning our thoughts toward the glorious PacNW summers. Now is a great time to get you, your horse and your tack ready for the show season and long hours in the saddle. As always I thoroughly enjoy my chiropractic and acupuncture work and am pleased to supply that service, but as the saddle part of my business starts to grow I am enjoying meeting new people and helping them solve their saddle fit concerns too. I have recently gotten a number of black country saddles in and have personally enjoyed riding in them quite a bit. I know my clients who have ordered black country saddles have been enjoying their saddles a lot too. Along with the traditional spring wood treed saddles I have had access to through a variety of companies I now have access to the Hastilow Concept range of saddles. These well built saddles are built on the adjustable simatree designed for its simplicity in gullet changing as well as overall flexibility allowing more of the saddle to change to a new width. This is a saddle option that I am excited to be able to provide. I hope all of you have had a great summer! I've had a rewarding summer filled with sunshine, horses and even some work. As always Chiropractic and acupuncture remain my main business focus (a job I find very rewarding) but I have enjoyed meeting many new faces at local horse shows and for saddle fitting appointments! I have been busy trying and buying saddles through the year and continue to gain knowledge about construction and fit of saddles. I have a growing group of demo saddles (both dressage and jumping) that I would love to share with you if you find yourself looking for a new saddle. I have also been quite busy helping out with CANTER WA trying to make it out to emerald downs on a frequent basis to talk to trainers and take listings of horses looking for their next career. Thoroughbreds are a great love for me and I enjoy helping them find their next home. If you're looking for an OTTB contact me, I just may be able to help you find a great partner. ​Lastly, as the holiday season approaches and you are looking for that hard to please horse or pet or the trainer that simply has everything - consider contacting me for a gift certificate for chiropractic, acupuncture and/or saddle fit. Exciting plans are underway for MVVS! As many of you know I already have a strong interest in sport horse performance. I strive to help you and your veterinarian get the most from our equine athletes with therapies such as chiropractic and acupuncture as well as chinese herbs where appropriate. Recently I have been spending a fair amount of time helping many clients assess their saddles for their horses when signs of poor fit become evident in evaluating their horses chiropractic health and comfort. In striving to provide the best possible knowledge and experience to help clients and their animal athletes achieve their best I have decided to undertake training to become a qualified saddle fitter through the SMS. I will be attending an intensive week on not just saddle fit theory but also practical and hands on experience in saddle fitting this May. It is my hope to be able to provide quality and objective saddle fitting services to my clients starting late May/early June 2015. I have purchased some great tools to help evaluate pressure points and horse shape that I plan to use in conjunction with the biomechanical and palpation training I have with my background as a veterinarian and animal chiropractor. I hope to set up a positive working relationship with saddle retailers, makers and suppliers to better advise clients when embarking on the daunting task of buying an appropriate (and hopefully much loved) saddle for their equine partner(s). Due to my travel schedule for May (both for business and personal/family plans) I will be on the east coast much of that time. Consider contacting me now for an appointment so I can be sure to get to see you and your animal soon. Look for me at the evergreen equestrian park in Monroe WA. I will be there cheering on my clients and patients and will be available for chiropractic and acupuncture therapy as needed for your hard working horses. Call or text to set up a specific time for treatment (recommend after planned competition for the day and ideally only light work the following day). Ask about the special discounts for first time treatments for trainers new to my practice. This year I have yet again donated 2 certificates for chiropractic and acupuncture treatments for your horse or companion animal to the WSHJA. They will be set up with the silent auction items. Bid generously! As many of you know I attended an advanced animal chiropractic module at the Options for Animals Chiropractic College early March. It was a great time to catch up with colleagues, review essential animal chiropractic techniques and learn new ways to help our animal friends! I hope everyone had a wonderful end to 2014 and a great beginning to 2015. This year many things will remain the same with MVVS and Dr. McCoy and some exciting small changes will also be taking place! I am happy to continue to work with the brand new CANTER chapter in WA based at Emerald Downs. I will at the track during race season to help trainers list new horses looking to find a new career and help prospective buyers find the OTTB that suits their needs. I will be continuing to go to many 3 day and hunter jumper shows around Washington both to support my clients and friends as well as help out with any chiropractic and acupuncture your hard working athletes may need to continue to perform at their best. In March I am also going to an advanced chiropractic course to learn about what is new in the field of veterinary chiropractic as well as expand on my knowledge of chiropractic techniques. This year the advanced course will also concentrate on behavioral problems in both our small animal and equine patients offering some unique perspective on how complementary medicine can help. Throughout the year I also plan on taking advanced TCVM courses on herbology. Some of you already know how much chinese herbs can help our pets. I'm excited to gain a more in-depth knowledge of how to treat common and difficult issues with chinese herbs through the Chi Institute. Don't forget to "like" May Valley Veterinary Services on Facebook. I try to post some of the fun and informative links that come across my screen. While you're on Facebook find CANTER WA and press the "like" button there too! I'm looking forward to another great year! Hope to see you soon! I'm happy to report it has been a busy spring. I have met many new clients and patients. Had a wonderful time working with Dr. Hank Greenwald to present an equine Chiropractic info session and even 2 working trips to Rochester NY. August 1st is tomorrow which means the beginning of many local shows both rated and schooling. I will be spending sometime at local 3 day events and the evergreen classic (look for the May Valley Vet sponsored class). If you are interested in meeting me, or having me look at your horse while I'm at the show grounds feel free to e-mail me or text me to set up a time. If you have trouble getting in touch with me via e-mail or phone please try mayvalleyvet@gmail.com and/or call again. I've had some technical issues with my voicemail and e-mail recently. If you don't hear from me within 24 hours please try again! After a busy fall of practice building, travel and even some horse shows Dr. McCoy is happy to announce a new partnership with the Seattle Canine Club. The Seattle Canine Club is a full service doggy day care and boarding facility with a new roomier location just south of the stadiums with easy highway access. Dr. McCoy plans on seeing SCC dogs as well as those of you new to us. She will be available for appointments many Thursdays. Like Seattle Canine Club on Facebook and let them know I sent you. Contact me for availability and additional details plus a discount on your first visit! As always Dr. McCoy is available to see your horse at your barn by appointment with availability evenings and weekends. Consider getting your horse evaluated now to help improve performance for the upcoming show season. Looking for updates more often? Like May Valley Veterinary Services on Facebook. Dr. McCoy will be back in the Rochester NY area to see Chiropractic and acupuncture appointments. There is some evening availability still. Please send an e-mail, text or call if you would like an appointment or to get more information. I can also forward a flier to anyone willing to hang one up in their barn or other horsey/animal locations if you're looking for a referral discount. Dr. McCoy enjoyed the last week of the acupuncture course in Florida and is already planning some continuing education in advanced chinese veterinary medicine next year. Now that she has passed the certifying exam she is looking for some great cases to write up to complete her certification requirements. As a thank you to all clients new and old Dr. McCoy is offering referral, pony club and 4H discounts for your next treatment. Remember to find May Valley Veterinary Services on Facebook and look for Thais at the local horse shows as she hopes to go and watch many, and if all goes well may get to ride in a few by the end of the season. Dr McCoy is traveling back to the Chi Institute in FL for the certifying exam in veterinary acupuncture. Appointments available in and around Rochester NY. Dr McCoy will be traveling back to the rochester area to see horses and companion animals for chiropractic and acupuncture appointments. Evening and weekend appointments available. E-mail, call, text or message for more information and availability. Dr. McCoy will be traveling for additional acupuncture and traditional chinese veterinary medicine training at the Chi Institute.